Find out everything you need to know on the new Hyundai Ix20 from independent vehicle review website Car And Driving. You can watch the video review to the left to see more of the car or read their written review below to get a true insight from an expert in the automotive industry. 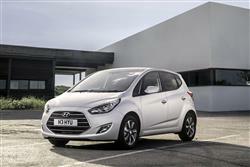 The Hyundai ix20 supermini-MPV has quietly captured a decent slug of UK sales. Here's the refreshed version. Jonathan Crouch reports. The Hyundai ix20 might initially seem an answer to a question nobody is asking. After all, modern superminis are so good these days, do people really need one with MPV attributes? In most cases, the answer is no, but in the case of the ix20, it genuinely does offer something over the standard i20 supermini that's sold alongside it. The latest updates don't change the script too radically and nor do they particularly need to. The ix20 sells very well and appeals to buyers who have done their homework and figured out that this unassuming Korean car offers a winning blend of practicality, safety, affordability and reliability. No, it's still not the most exciting thing you can buy but don't let that stop you. What was very good before just got a little bit better.